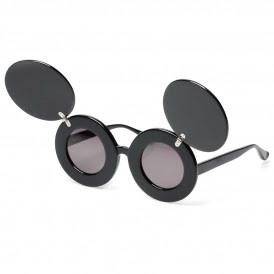 These Jeremy Scott Mickey sunglasses were worn by Lady Gaga in the Paparazzi video and by Beyonce in the Telephone video. They retailed for $450 at 80's Purple but are currently sold out. A wonderful reader, Katie, emailed me about this very affordable pair of similar Mickey sunglasses from Bleu Dame. They retail for $9.80 and you can click here to channel your inner Gaga/Beyonce. umm I might need these for halloween!